Limo hire in Doncaster,South Yorkshire.Doncaster limousine hire. Hire a limo in Doncaster. Doncaster stretch limousine Hire. Doncaster limos in South Yorkshire. 01302 556901. Arrive in Style Luxury Limousines are a Doncaster Based Limo Hire company. You may recognise this venue as the Armthorpe rugby club in Doncaster, our limos are quite often here for weddings and school proms. Doncaster is a large town in South Yorkshire, England and the principal settlement of the Metropolitan Borough of Doncaster. The town is located about twenty miles from Sheffield and is popularly referred to by some of its residents as Donny. Doncaster has a new International airport and its centre has undergone regeneration including the development of an Education City campus, currently the largest education investment of its kind in the UK. Doncaster has also recently extended the Frenchgate Centre, a shopping centre and transport interchange. Luxury Stretch Limos have always been a symbol of status, style, elegance and glamour. We are the premier limousine hire company in Doncaster and set the standard for limousine hire in the Doncaster Area. Knowlege of the local area is a major factor when considering limousine hire in Doncaster. We provide limo hire for any occasion or simply a means of getting from A to B in Doncaster in comfort and style. Call our Central Bookings Office on 01302 556901 or just call in and see us on Wheatley Hall Road, Doncaster.. It is often said that "It's not the destinstion, it's the journey" and we are her to make your limo journey in Doncaster as perfect as possible. We offer luxury limousine hire in Doncaster, South Yorkshire catering for Doncaster Weddings, Airport Transfers for Doncaster Sheffield Robin Hood Airport, Airport Transfers from Doncaster to Manchester Airport, East Midlands Airport, Leeds Bradford Airport or Limo transfers to any London Airport. We supply LICENSED Limousines for Aniversaries, Restaurants, Doncaster Clubs and Pubs and hotels. Whilst the maximm number of passengers is restricted to 8 for most limousines we can supply an exclusive H200 Megastretch Limousine capable of seating 16 passengers. Doncaster Birthday Parties, Doncaster School Proms, Race Meetings by Limo to Doncaster Races, York Races, Pontefract Races or make it a full day out at Royal Ascot. Shopping trips to Sheffield Meadowhall or Manchester Trafford Centre. A childrens limo party is very popular for kids birthdays, our Hummer Limos in Doncaster are the most requested limousine. We have special deals for Hummer Limo Hire in Doncaster for kids parties in Doncaster. We offer a selection of limousines in Doncaster. You can view recent photos of our limos on this site. These are our actual limos, available for you to hire in the Doncaster Area. Remember, some limo operators use borrowed photos and show different angles of the same limo to give a false impression. Ask questions to make sure you get what you expect. Sit back, Enjoy the Ride, Travel in Luxury and Arrive in Style! Excalibur Superstretch Limousine hire in Doncaster.Weddings,birthdays,aniversaries,proms,airports,races,clubs,pubs,restaurants,shopping,theatre. Excalibur limousine for hire in Doncaster and surrounding area for weddings and special occasions. This limousine has 1930's styling and seats 8 passengers. Want to make everyone look? Stand out from the crowd with our "exclusive"
Limo hire in Doncaster South Yorkshire, 08003287004 Doncaster Limo Hire. Limo hire in Doncaster, Modern limousine hire in Doncaster. Pink limo, Excalibur limo, Hummer liimo. Limo hire in Doncaster, Hummer Limo, White Limo, Gold Limo, Excalbur Limo. Doncaster Limousine Hire. Premier Limousine Hire in Doncaster. Limousine hire in Doncaster. Modern white limousines for hire in Doncaster, South Yorkshiire. In Doncaster we hire modern limos for all occasions including restaurant trips, prom limos, wedding limos, party limos, engagements, birthday and anniversary limos. Our Doncaster limo business is the longest established limo company in Doncaster, we also have the biggest and most modern fleet of limousines in Doncaster so you, the customer, can book with confidence. We provide limos for kids parties, hen party limos, pubs and clubs. We cover all of the South Yorkshire Area and can offer for hre white limos, black limo, Excalibur limo and our new Hummer limo. Our Excalibur limo is available for hire for Weddings, Proms and special occasions. In Doncaster we specialise in Airport Transfers to Doncaster Sheffield Robin Hood Airport, Manchester Airport Limo, East Mdlands Airport Transfer Limo. Our limousines are correctly licenced, fully insured for private hire and our Uniformed Chauffeurs are fully trained. Want to stand out from the usual crowd? Travel in Comfort and "Arrive in Style" in Doncaster in one of our Superior Stretch Limousines. Limousine hire doncaster, wedding cars Doncaster, Doncaster wedding car hire, limo hre for weddings in Doncaster, Doncaster limo hire, hire a stretch limo in Doncaster, Doncaster limos, Limod Doncaster, American stretch limos in Doncaster, Airport limos in Doncaster, Doncaster Airport limos. Modern limos in Doncaster, Black limo hire in Doncaster, White limos in Doncaster, Hummer limo in Doncaster, Vintage style limo in Doncaster, Doncaster limos, Limo hire in Doncaster, Airport shuttle limo in Doncaster. Limousine hire in Doncaster, limo hire in Wakefield, limo hire in Barnsley, limo hire in Rotherham, limo hire in Pontefract, limo hire in Castleford, limo hire in Goole, limo hire in Selby, limo hire in Sherburn in Elmet, limo hire in Scunthorpe, limo hire in Harrogate, limo hire in Worksop, limo hire in Retford, limo hire in Gainsborough, limo hire in Sheffield. Modern white limousines for hire in Doncaster, Wakefield limos, Sheffield limos, Gainsborough lmos, Worksop limos, Retford limos, Scunthorpe school prom limo, Castleford limos, Pontefract limos, Selby limos, Barnsley lmos. In Yorkshire we hire modern limos for all occasions including restaurant trips, prom limos, wedding limos, party limos, engagements, birthday and anniversary limos. Modern Lincoln Town Car Limos, Vintage Style Excalibur Limo and new for 2006 our Hummer Limo, all for hire at cheap prices in Yorkshire. Hire a limo for a day at the races, a cruise around town or a taxi ride. Our Limo business is a well established limo company in Yorkshire, we also have one of the biggest and most modern fleets of limousines in Yorkshire so you, the customer, can book with confidence. We provide limos for kids parties, hen party limos, pubs and clubs. We cover all of the Yorkshire, Nottingham and Lincolnshire Areas and can offer for hre white limos, black limo, Excalibur limo and our new Hummer limo. 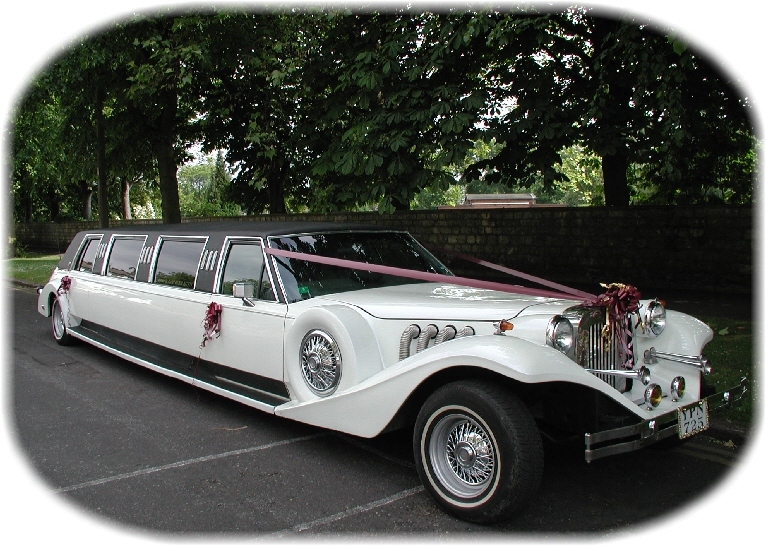 Our Excalibur limo is available for hire for Weddings, Proms and special occasions. In Yorkshire we specialise in Airport Transfers to Doncaster Sheffield Robin Hood Airport, Manchester Airport Limo, East Mdlands Airport Transfer Limo. Our limousines are correctly licenced, fully insured for private hire and our Uniformed Chauffeurs are fully trained. Want to stand out from the usual crowd? Travel in Comfort and "Arrive in Style" in Doncaster in one of our Superior Stretch Limousines. Wedding limo hire in Doncaster, Doncaster limousine wedding hire, We hire limos in Doncaster for weddings. Church weddings limos, Doncaster Register office wedding, Civil weddings, Asian weddings in Doncaster South Yorkshire. Excalibur 8 seater wedding limo, Black wedding limo, White wedding limo, White hummer wedding limo in Doncaster, South Yorkshire. Limo for hire for Civil Partnerships.Doncaster Wedding Limo Hire. Limo Hire in Doncaster Area. School prom limos, limo for school proms in Doncaster, Doncaster school prom limo, school prom limos in Wakefield, Wakefield school prom limos, Limos for school proms in Barnsley. Barnsley school prom limo, School prom limos in Rotherham, Rotherham school prom limos, limo hire for school proms in Yorkshre, Yorkshire school prom lmos. Barnburgh limos, Harlington Limo hire, High Melton limousine hire, Cadeby limos, Sprotborough limo, Scawsby limo hire, limo hire in Cusworth , Balby limos, Hexthorpe limos, limo hire Warmsworth, Bentley limos, Hyde park limos, Belle View limo hire, limo hire in Bessacarr, Cantley limo hire, Intake limos, Wheatley limos, Branton limo hire, Nutwell limos, Auckley limos, limo hire in Blaxton, Wroot limo, Brodsworth limos, Hickleton limo hire, Brodsworth limos, limos in Frickley, Bentley limos, Scawthorpe limo hire,limo hire in Toll Bar, Woodlands limo, Adwick limo hire, Arksey limos, Limo hire in Edenthorpe, sunnyside limos, Kirk Sandall limo hire, Barnby Dun limos, Limo hire in Dunsville, hire a limo in Hatfield, Dunscroft limos, Hatfield Woodhouse limos, Skellow limo hire, Carcroft limos, Owston limo hire, Askern limos, Campsall limos, sutton limos, Burghwallis limousine hire, Stainforth limos, Fishlake limos, Thorne limousines, Moorend limo hire, Crowle limos, Edlington limos, Wadworth limo hire, Conisbrough limousine hAnchorage school prom limohire, Armthorpe school prom limos, Balby carr school prom limo, Bently school limo prom, Campsmount school prom limo, Chase school prom limo, Don valley high school and performing arts college prom limos, Danum School Technology college prom limos, Edlington School prom limo, Hall Cross School prom limos, Hatfield High School prom limousine, Hayfield school prom limo, Hill House St. Mary ' s school prom, Hungerhill School prom limo, Mc Auley prom limos, Mexborough school prom limos, Northcliffe school prom limo, North Doncaster Technology College School Prom Limo, Ridgewood School prom Limos, Rossington All Saints School Prom limo, Prom limos for all Doncaster Schools. Thorne Academy Prom limousine. Doncaster Deaf School prom limo.hire, Loversall limos, Rossington limos, Finningley limo hire, Misson limos, Bawtry limousine hire, Limo hire in Harworth, Austerfield limo hire, Everton limos. Airport transfer limousine Doncaster, Airport Transfer limousine Wakefield, Airport Transfer limousine Rotherham, Airport transfer limo Skellow, Carcroft Airport Transfers limo, Adwick Airport Transfer limousine, Bentley airport limo, Askern Airport Transfer limo, Bessaccar Airport Transfer limo hire, Finningley Airport Limousine, Scunthorpe Airport Transfer Limousines, 8 passenger limo Airport Transfer, Hummer limo Airport Transfer Doncaster, Black limo Aiirport Transfers, White limo airport Transfers, Airport limousine specialist in Yorkshire, Specialist Airport Transfers in Doncaster, Limo bookings Airport Transfers, Airport Transfers in Style in Doncaster, Arrive in Style Airport Transfers, Pontefract Airport Transfers limo hire, Cheap Airport Transfers in Yorkshire. Limo Hire in Denby Dale, Limo Hire in York, Limo Hire in Harrogate, Limo Hire in Knaresborough, Limo Hire in Leeds, Limo Hire in Tadcaster, Limo Hire in Saxton, Limo Hire in Wetherby, Limo Hire in Boston Spa, Limo Hire in Walton, Limo Hire in Aberford, Limo Hire in Saaxton, Limo Hire in Clifford, Limo Hire in Bramham, Limo Hire in Mcklefield, Limo Hire in Garforth, Limo Hire in Kippax, Limo Hire in Ledston, Limo Hire in Fairburn, Limo Hire in Brotherton, Limo Hire in Kellingley, Limo Hire in Ferrybridge, Limo Hire in Darrington, Limo Hire in Womersley, Limo Hire in Wentbridge, Limo Hire in Barnsdale Bar, Limo Hire in Kirk Smeaton, Limo Hire in Campsall, Limo Hire in Burghwallis, Limo Hire in Skellow, Limo Hire in Carcroft, Limo Hire in Badsworth, Limo Hire in Carleton, Limo Hire for nice people, Limo Hire in Allerton Bywater, Limo Hire in Rothwell.